My boyfriend’s mom is a big quinoa fan. For Christmas, I bought her Quinoa Revolution (you can buy it online). 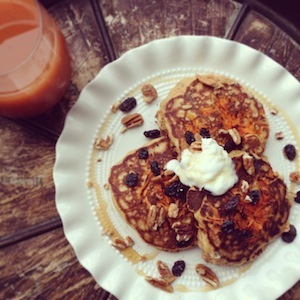 Before gifting it, I snapped a pic of this ‘Carrot Cake Pancake’ recipe – it sounded so good. Turns out, the recipe is a winner. For a pretty pop of color, add pinches of grated carrots to the pan before adding your batter. Pour batter on top of carrots, then flip to reveal your pretty ‘carrot flower’.